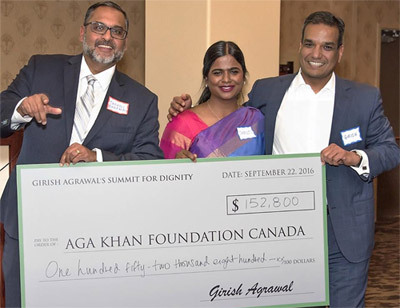 Agrawal Associates Private Wealth Management is proud to be a member of the Calgary community and regularly supports worthy causes related to education and health.. In 2016, Girish Agrawal successfully climbed Mr. Kilimanjaro in Tanzania. As part of this initiative, he set out to raise $250,000 for The Aga Khan Development Network, a non-profit international agency that supports social development programs in Asia and Africa. The goal is to help bring proper sanitation to 700,000 people in India. Girish Agrawal is proud to provide an annual award for a full-time student enrolled in the third year of the Bachelor of Communication program at Mount Royal University in Calgary. In 2012, Girish Agrawal provided a significant endowment to the Calgary Health Trust to support the continuing education for staff specific to the treatment of contagious diseases. Not typically funded by the government, this private support allows medical professionals to enhance their training each year. Thanks to your kind generosity, Alberta Population and Public Health are able to benefit from an annual education day with the goal of increasing staff knowledge, enhancing efficiency of work processes related to outbreaks and emerging infections and a celebration of staff achievements in service delivery, program development and excellence in leadership. Through Plan Canada, Agrawal Associates Private Wealth Management supports the education and living expenses of two young girls — one living in India and the other in Nepal.